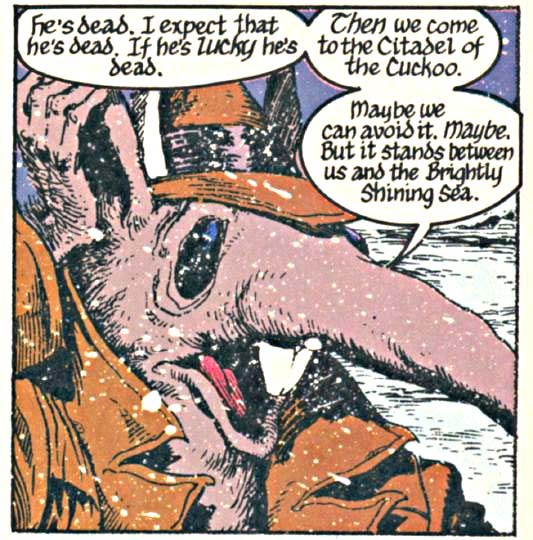 Sandman #21 ©DC Comics, Inc. In issue 22 we got a first good look at the Library of Dream, and (I believe) first met the raven Matthew, one of my favorite characters. I gave him a scratchy lettering style and a balloon border made of overlapping strokes, like untidy twigs. In the library, I always enjoyed putting in the titles of imaginary or unfinished books, most of which Neil had in the script, but occasionally I volunteered a few. This issue also has what I thought was one of Neil's most brilliant pieces of character development. Cain had been the host of DC's HOUSE OF MYSTERY comic for years, accompanied by his brother Abel in HOUSE OF SECRETS. Created by Joe Orlando when the books were launched, they had always been played for laughs, though with a grim undertone. Neil brought them right back to their Biblical roots in SANDMAN, having Cain always killing his brother (who then came back to life), but the really brilliant bit of business in this issue was sending him as his envoy to Lucifer in Hell. Neil remembered that in the Bible Cain bore a mark that would not allow him to be killed, the "mark of Cain", thus making him the perfect go-between! Great stuff. So, we have the Endless and other denizens of The Dreaming, special styles, check. Lucifer and his demons, special styles, check. Soon, a collection of other gods and powers were added to the mix, as they gathered to fight over the Key to Hell. Order and Chaos, Egyptian gods, Norse gods, a Japanese god, Angels...most with special styles. Things were really getting complicated! Somehow, though, it Neil made it all work, and the variety of styles never felt arbitrary or labored. I do remember saying to Neil that perhaps the next storyline should be a little simpler, style-wise. I did get a break for issues 29-31, but then we were into "A Game of You". 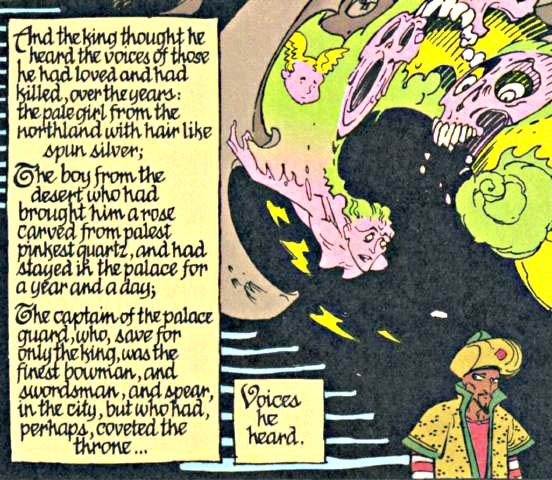 I enjoyed this story, though it did involve quite a lot of the calligraphic style I had created for Barbie's fantasy dream world in SANDMAN 15. Neil was apologetic, he hadn't expected to be bringing her back. Actually, I liked doing this style, though it did take longer than regular lettering. 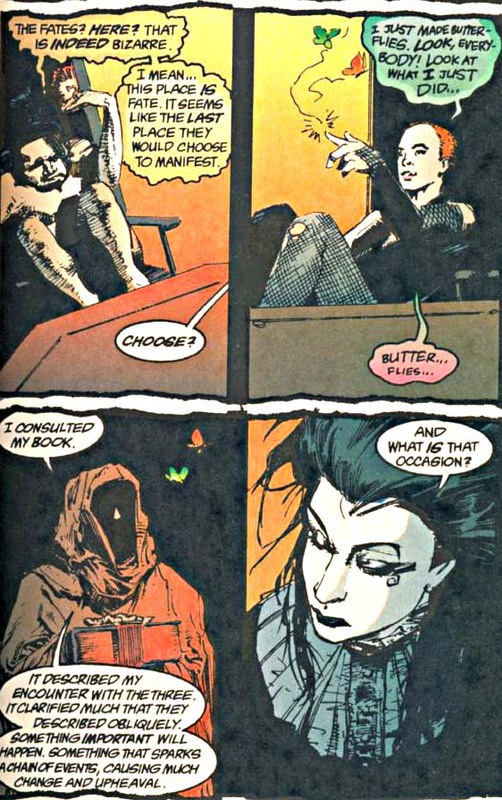 Sandman #35 ©DC Comics, Inc.
After that came the "Brief Lives" storyline. Was this the first speaking appearance of Merv Pumpkinhead? I'm not sure, but he was another favorite character. Brief lives had a tedious amount of Delirium lettering to get through, but otherwise was fairly straightforward for me. I do recall a lot of tight deadlines, though, as Neil was slowing down in his writing speed. Artist Jill Thompson was faxing me pencilled pages to letter over one page a day, at one point, as soon as she got them done, as she was getting the script in small bits. Issue 50 is my favorite single issue of the series. I had long been a fan of P. Craig Russell's art, and was delighted to work with him here. And his work was extremely easy to letter on, as Craig pencils in each word of the lettering exactly where he wants it to be. For the style, I wanted something exotic in an Arabian Nights way without being too hard to read. Somehow this is what came out. Neil's story was also one of his very best, beautifully told, with the economy and finely crafted language of great poetry, yet utilizing all the advantages of comics storytelling. I was proud to be part of it. Sandman #50 ©DC Comics, Inc.
Use the tabs at the top of the page to move to other areas, such as HOW TO for tips and information on how to do your own lettering.